It’s been standard clinical practice for some time to aim for a lower blood pressure in diabetic patients with hypertension compared to hypertensive patients with normal glucose metabolism. Like so much in medicine this approach was based on surmise rather than evidence. The thinking went along these lines. Diabetics are at greatly increased risk for adverse cardiovascular events. Hypertension is a major risk factor for these bad outcomes. Therefore the combination of the two is so conducive to stroke, heart disease, and renal disease that blood pressure should be lowered to a level less than that recommended for non-diabetic patients with hypertension. A recent paper in the New England Journal of medicine put this practice to the test. Effects of Intensive Blood-Pressure Control in Type 2 Diabetes Mellitus presents data from two groups of otherwise identical individuals with type 2 diabetes. In one group systolic blood pressure was lowered to 135 to 140 mm Hg. In the other blood pressure was reduced to about 120. With the exception of a small but significant reduction in stroke, lowering blood pressure to 120 did not improve out comes. These results are shown in the table below. The authors of this study estimate that if this reduction in stroke is real 89 patients would have to be treated for five years to prevent one stroke. Not surprisingly, the patients with the lower blood pressures had a greater incidence of side effects attributable to the greater dose of anti-hypertensive medication required to achieve a lower blood pressure. These included hypotension, syncope, and hyperkalemia. This is just one study, but it likely indicates that lowering blood pressure below 140 combined with optimal care of the diabetic patient is probably the best course. 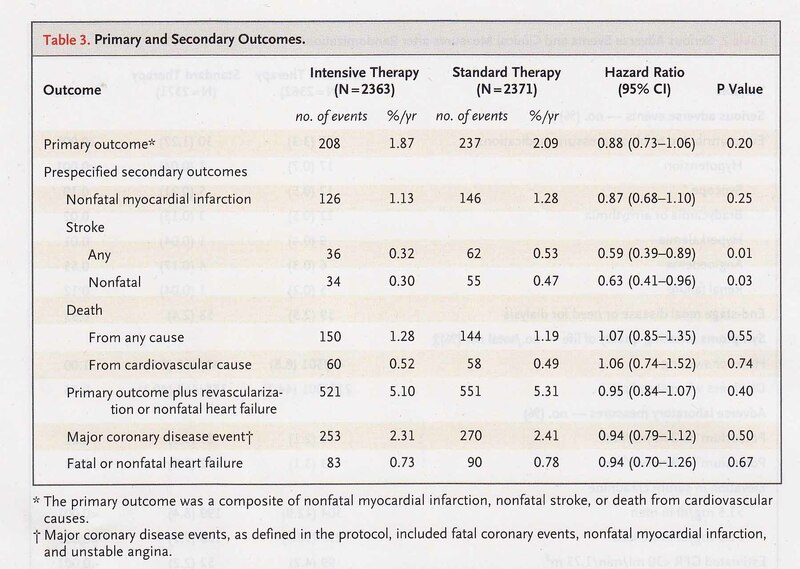 Any further gain in outcome in these patients due to vigorous anti-hypertensive therapy is probably canceled by the increase in side effects that are inevitable when blood pressure is lowered to 120. It is interesting how we cling to wrong things.A patient of mine was given a severe lecture by his diabetic doctor for having a HgbA1c of 8. There is poor evidence that lower than 8 is better and the doctor spent all his time on that and none on how to make it better.